House and time at Malvern: No 7, 1906 - 1908. Died: 01 September 1917 aged 27 in France. Died of wounds. Son of William Hanley Hutchinson and Elizabeth Clare Hutchinson, The Meads, Ripon. b. 1890. Great War, Lieutenant 2nd/5th Bn. West Yorkshire Regiment (Prince of Wales's Own) 1914 (overseas). The announcement of Lieutenant Hutchinson's death has been received with very great regret in Ripon, where he was very highly esteemed by all who knew him, and his sad death has cut short an exceedingly promising career. Lieutenant Hutchinson was educated at Kent House School, Eastbourne, and at Malvern College, where he remained until he passed his preliminary examination for the law. He served his articles with his father until the last six months, when he went to the firm of Messrs Crossman, Pritchard and Co., of London, where he finished his articles. He passed his final examination and was admitted as a solicitor on the 13th October 1913. He practised in Ripon until the end of September 1914, when he joined the West Yorkshires, his commission being dated September 30th, 1914. He completed a thorough training in England with his regiment, and was appointed machine gun officer. He was a good officer, a smart soldier, and greatly esteemed by all ranks. He first went on active service at the beginning of January this year, returning home for ten days' leave in July last. He returned again to the Front on the 1st August. Prior to the war Lieutenant Hutchinson was deeply interested in the Church Lads' Brigade, and held the rank of lieutenant in the Ripon Cathedral branch. 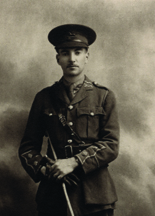 Lieutenant Allan T Hodgson, in a letter to the bereaved parents, says: "Dear Mr Hutchinson, It is with great sorrow that I have to write to tell you of the death of your son in action on the morning of the 22nd November whilst gallantly leading his men to repel an enemy counter-attack near Bourlon Wood. He led his men splendidly throughout the great attack of the 20th and 22nd November. He has proved himself a gallant young officer, and I am proud to have had him under my command. Both his fellow officers and men join with me in most sincere sympathy for you and your family in your bereavement. There is a marble memorial tablet to him at Ripon Cathedral.